We are working on last steps of getting a genome together including annoation. As of now we are working with version 070 (via Phase Genomics, with Hi-C added to 10X, further improved with 10k MP library alignment) with about 300k scaffolds. And reduced versions limited to scaffolds greater than 10k bp version 071 and greater than 10k bp version 073, with 14014 and 1350 scaffolds respectively. To get a crude gene track for the Oly genome the big transcriptome was compared to genome. We took DNA from a single Eastern oyster and prepped using MBD, MSP digestion, and plain old DNA. Full details can be found here. I have to share some information with several new folks, and there are likely old folks that should give this a refresh… thus I am posting it here. Full running of the OAKL samples. As a better assembly is coming online for the Geoduck, we have started to look at Bismark mapping of prior samples. In an attempt to start to visualize differences while waiting on hardware I brought some Bismark alignments into methyKit. I have been working through Bismark with a few Crassosstrea virginica datasets. This includes the BS data from the 2015 Oil exposure experiment, OA exposure - gonad tissue (OAKL), and a full suite of library preps via Qiagen. It seems that mapping rates can very a lot. We have a new data set comparing WG-BS, RRBS, and MBDBS. This is valuable as it offers data to run the math on what is most optimal. This first step is mapping. Here I explore CLC results as we are working with Qiagen and this is the software the are using. Here are data corresponding to different types of library preparation. 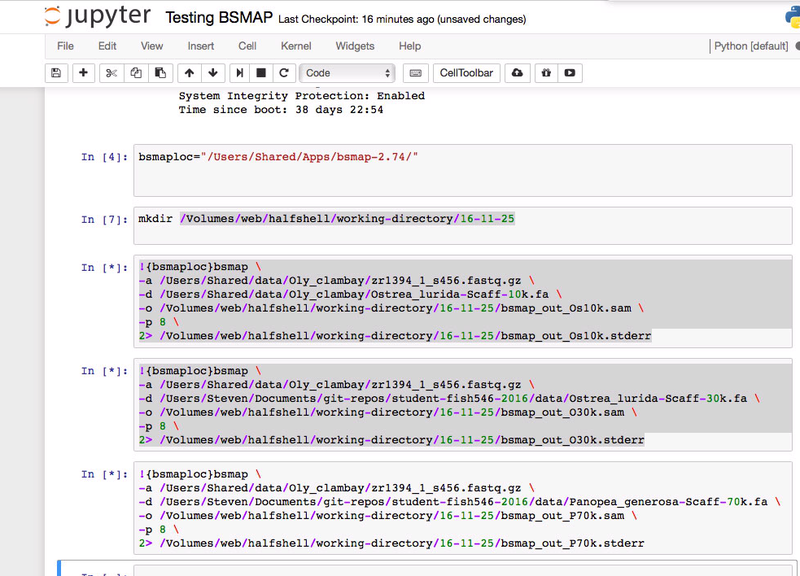 I am exploring a few versions of the PBjelly Olympia oyster genome assembly and bisulfite read mapping. There are several options for fasta output of Supernova assemblies. Supernova completed the 10x Chromium data assembly. About a week ago I started a Supernova 2.0 run to get some of this Chromium 10x data assembled. We had a nice chat about how to reboot a couple of proteomic projects. Running some alignments for Charlie. As part of this Geoduck Larvae Trial we will be running some filters through proteomics and metagenomics. Getting back to the command line. 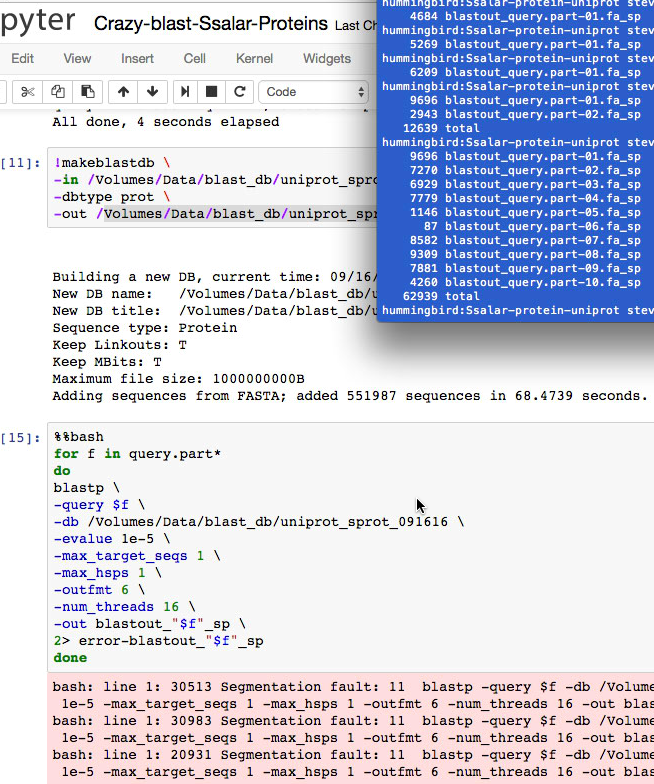 Running QUAST to compare genome assembly. Here is a Summary of the Illumina NS++ data dump (by platform). Exploring the different aspects of data generated for the Oly genome. Per this issue I took at look at some of Yaamini’s data. Sam has compiled the current status of Olympia oyster genome assemblies here. I am going to try to assess differences. We have a few MiSeq files. Here is a summary of the new data dump. While we received a lot of files in HiSeq folder, none were fastq, thus Sam downloaded from BaseSpace. And it is ugly. Using the Trandsdecoder and the Trinity assembly, a deduced proteome was generated. Having spent a day in Hyak, I think I know have a workflow that makes sense. In preparation for new proteomic analysis here is a transcriptome from the NovaSeq. Running Trinity on Mox. Geoduck larvae. 4) do a left join. Here is how one might go about visualizing Proteomic Data. This is based on a list of proteins Laura found to be different in geoducks in eel grass (as opposed to not being in eel grass). Here is an attempt to annotate about half of the 41 DMRs Sean has identified. Sean has identified 41 loci that are different in the 3 treatments at Day 10! Having run the first batch of geoduck RRBS throught CoGe - Here is the mCpG file and information of how these files were generated. Fifty RRBS Libraries were constructed by Hollie and sequenced (Maybe? these numbers do not match nightingales). I went out to Manchester yesterday and checked on the TripleT (Two Treatment Trial) project. Another quarter is complete for our Bioinformatics class , and once again we learned a bit. Mapped RNA-seq reads yesterday. Today trying 2bRAD that matches BS data. 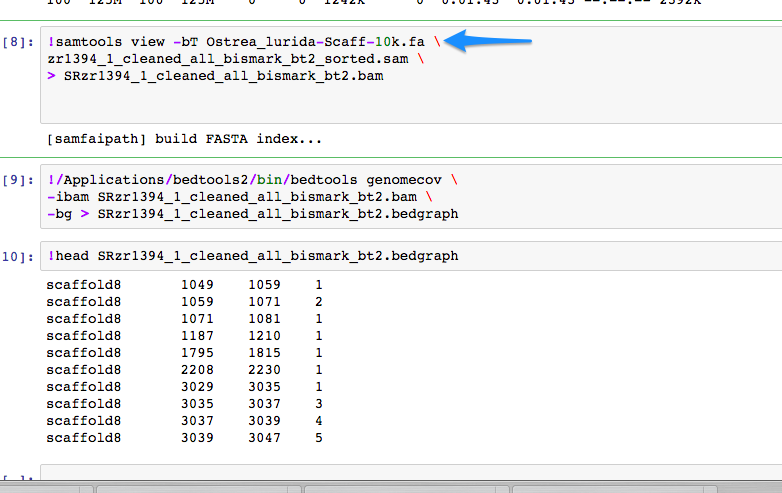 Running BSMAP on version of Ostrea lurida genome that is limited by 10k minimum scaffold threshold. With a third blasting and comparing hits for all 10 parts of the query, I am satisfied with the output. On genefish. Will try splitting. Working on the finalizing the big table for the the transcriptome. Analysis of eight Fidalgo Olympia oysters. Maybe I just need a second sentence. [samopen] SAM header is present: 765755 sequences. @ Sat Oct 22 09:54:10 2016: done. 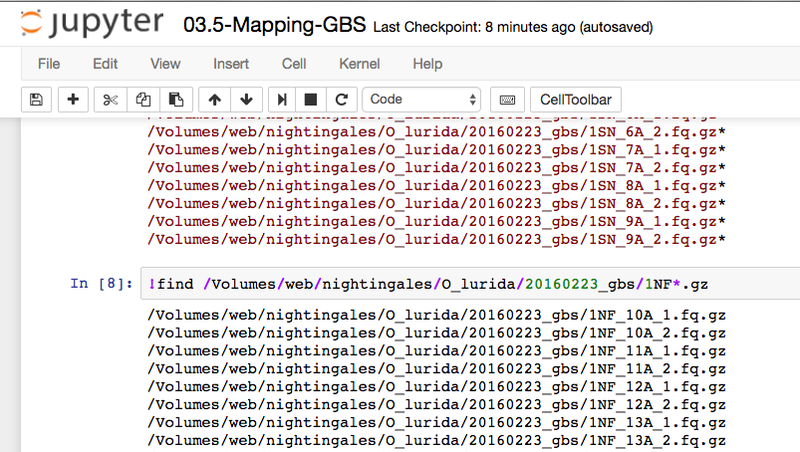 total 467574 valid mappings, 618824 covered cytosines, average coverage: 2.02 fold. @ Sat Oct 22 10:01:55 2016: done. total 579365 valid mappings, 689492 covered cytosines, average coverage: 2.19 fold. @ Sat Oct 22 10:09:37 2016: done. total 579579 valid mappings, 678634 covered cytosines, average coverage: 2.24 fold. @ Sat Oct 22 10:17:20 2016: done. total 577435 valid mappings, 690889 covered cytosines, average coverage: 2.18 fold. @ Sat Oct 22 10:25:04 2016: done. total 608092 valid mappings, 691864 covered cytosines, average coverage: 2.27 fold. @ Sat Oct 22 10:32:57 2016: done. total 604365 valid mappings, 689831 covered cytosines, average coverage: 2.27 fold. @ Sat Oct 22 10:40:32 2016: done. total 507109 valid mappings, 646374 covered cytosines, average coverage: 2.09 fold. @ Sat Oct 22 10:48:21 2016: done. total 689625 valid mappings, 732123 covered cytosines, average coverage: 2.42 fold. 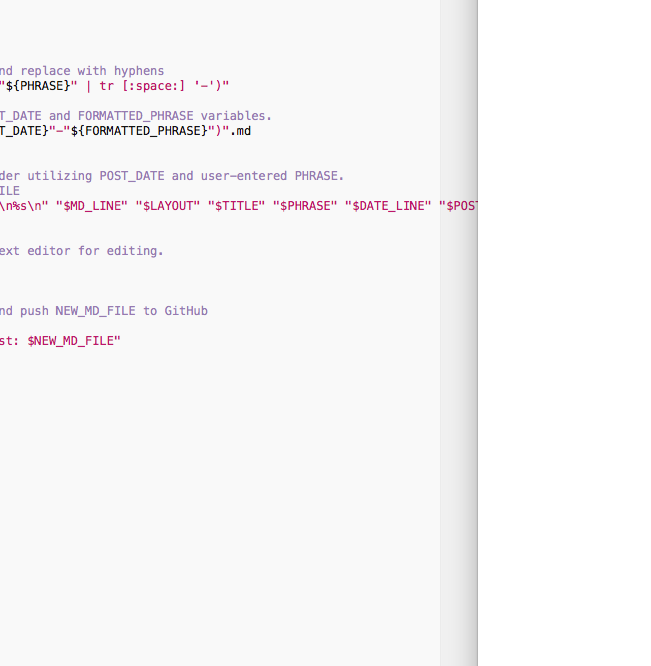 #first methratio files are converted to filter for CG context, 3x coverage (mr3x.awk), and reformatting (mr_gg.awk.sh). Last year Cris sent me some Atlantic salmon lncRNAs (~21k) where he wanted to know what the adjacent gene ID. I started analysis of two gigas samples to eventually be compared with methylRAD. 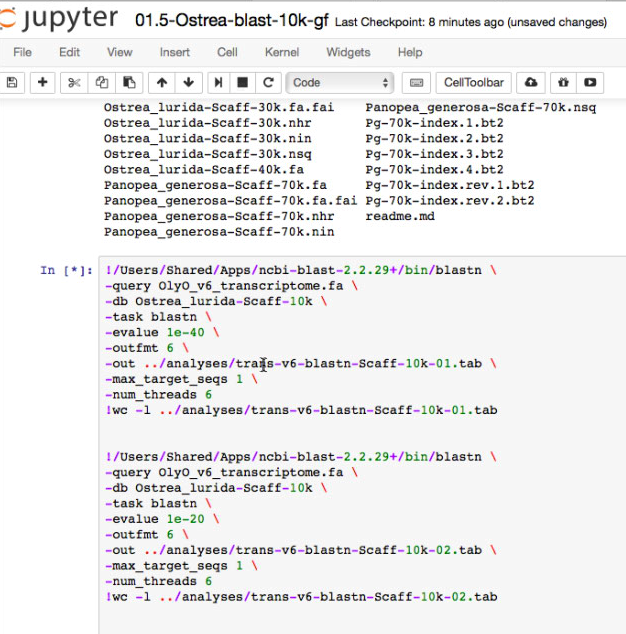 Below is a snapshot of the Jupyter notebook. We sampled 96 oysters that were part of Katherine Silliman’s summer project. These oysters were from three locales and had spent about 48 hours in OA treatment (half in contol water). Full sensor data is available here. Getting closer to a master table for a the gonad transcriptome. 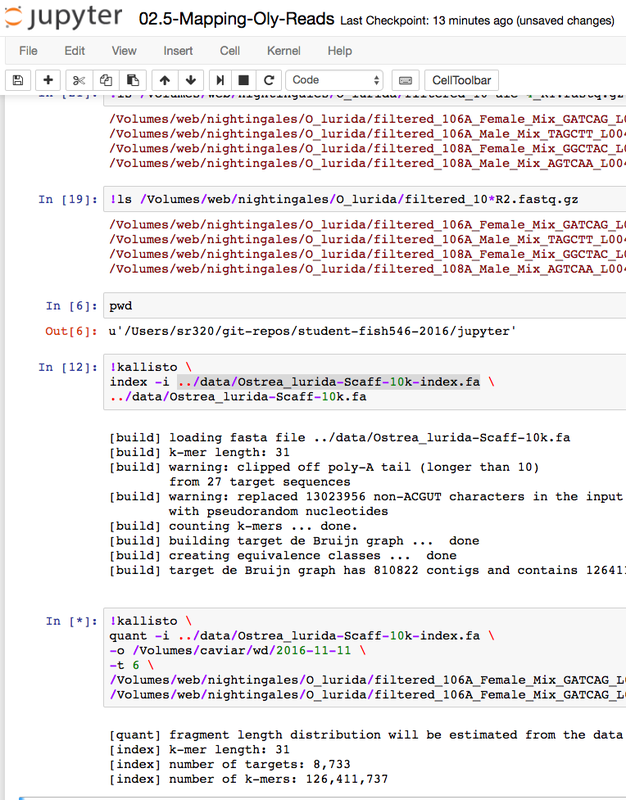 After kicking around how to make a very big table with all of the annotations… I finally made some progress. Frustrated with roll you own option in with EBI GO association files etc. I am trialing Blast2GO commandline. It was not much better getting going but it is downloading stuff now. As per this pipeline I will run the 8 individuals in the environmental epigenetics mini-experiment.